On the last day of our friend's visit (which was two days ago, but I don't have to be accountable to you for every single second of my life, do I? 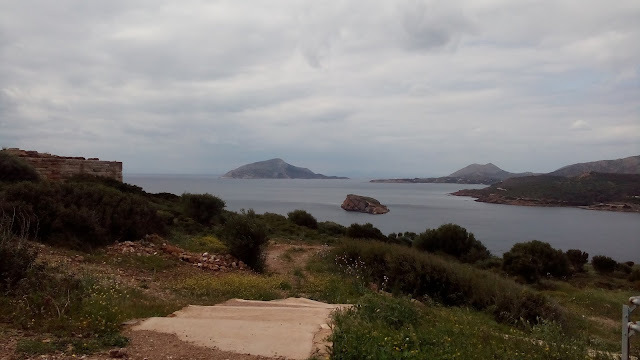 ), we walked to laiki, drove to Sounio, got cursed by a panhandler, and were harassed by a bunch of souvenir hawkers. We also had really good food at a taverna. I was peer pressured into buying this. I took it home, set it on the counter for a second, picked it up again, and immediately whacked off one of the buds. Don't ask me about my gardenia. Some days it does really well, and other days it looks dead. This is lovely, lovely Sounio. 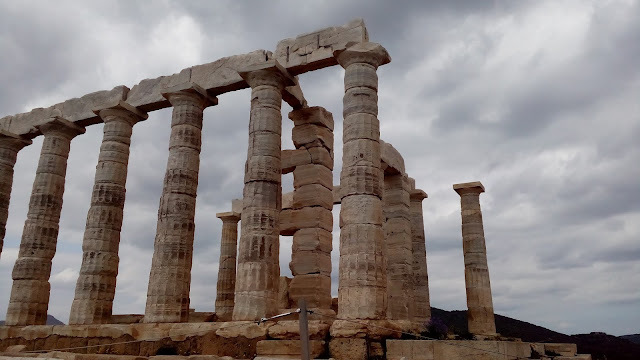 Rick Steves didn't mention it at all in his Athens and Peloponnese guide book, which I think should be accounted unto him as a sin. Phil and I took our Christmas card photos here. This is the Temple of Poseidon. Have I shown you this already? Maybe I have. Last time we were here, it was 80 degrees. This time it was much chillier. Somewhere around the base of these columns, Lord Byron (or one of his fans) carved a big "Byron" into the stone. We couldn't find it. If you look closely at the window, you can see a white cross made out of soapy bubbles. 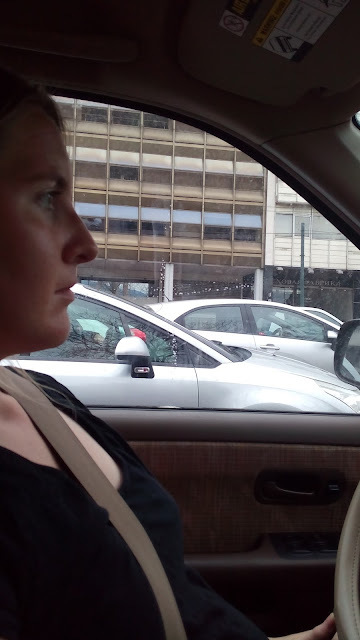 We were waiting at a stoplight in Athens, and a young woman came over to wash the windshield. I told her no, but she started washing it anyway. I rolled down the window and told her no, but she ignored me and kept washing. Then I got mad. It's probably half hormones, but I hate being pressured by panhandlers. She came around to my window and tapped on it, looking for payment. I gave her a very angry face and gestured to say, "What do you want me to do about it? I told you no." She saw the food in our car and asked for some. I gave her the same look and told her no. Before the light turned green, she used her squeegee to tap out this soap cross on my window. I'm going to buy an evil eye keychain, so if this ever happens again, I can just shove it up against the window along with my middle finger. Soap chick was just a harbinger of things to come. The panhandlers and souvenir hawkers in touristy Athens (Plaka, Monistiraki) are super aggressive. These areas are also prime zones for pickpockets. Be aware of people in those areas, and be assertive. One lady grabbed my arm hard enough to hurt to try to get me to pay attention to her. If I could live Thursday over again, I would yelled a lot more. Now I know, and now you know. Don't be gentle. 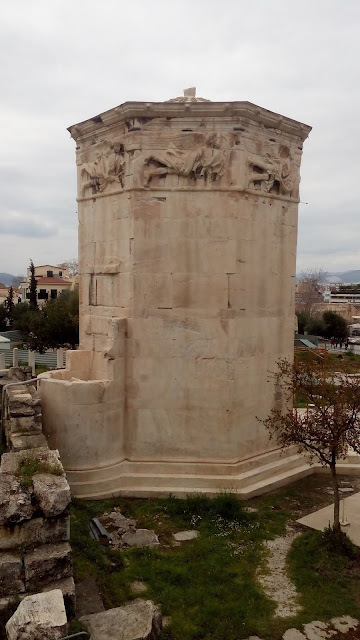 This is the Tower of the Winds at the Roman Agora, between Plaka and Monistiraki. This is the same area where the lady grabbed my arm, so if you see this thing, steel yourself for aggressive sellers. 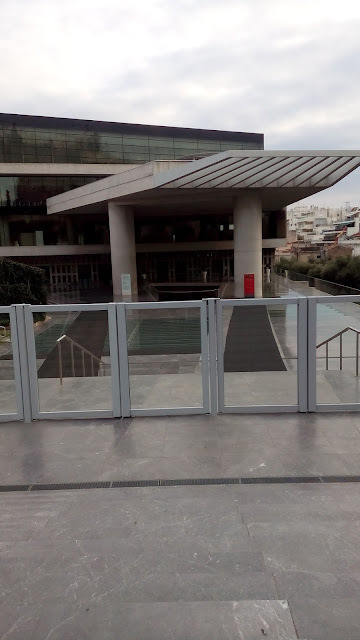 This is the Acropolis Museum, which was closed by the time we got to it. The internet is a great resource for a lot of things, but not so great for telling you the correct closing times of sites in the city. I would highly encourage you to call in advance, or just pop by the museum on your way up the hill, to make sure you know when it closes. 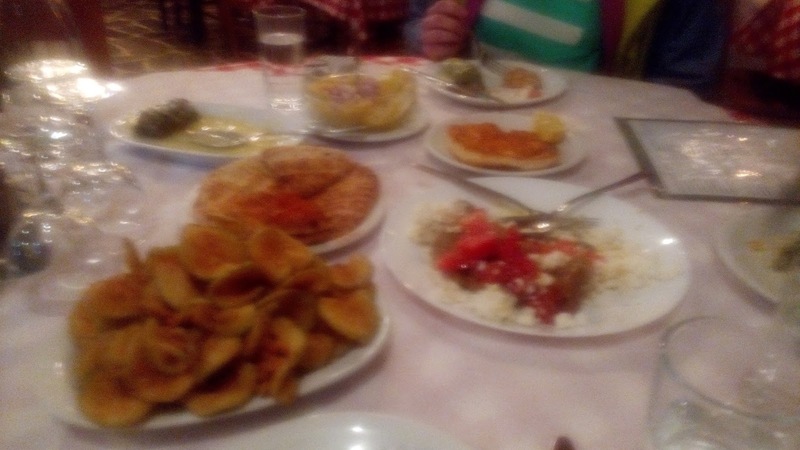 This is a very blurry look at our taverna food. I thought about not showing it to you, because how embarrassing is it that I can't take a focused photograph? But I kind of like how ethereal it looks. Greek food is not my top choice of cuisine, but we really liked this taverna. Our friend left early Friday morning, and it was a mega-bummer. She was a wonderful guest, and we had a lot of fun. I spent Friday and Saturday moping, and working on professional development crap. I'm trying to cram in as much as possible while we're still childless. I wanted to give you notice about some upcoming posts I'm planning to write. 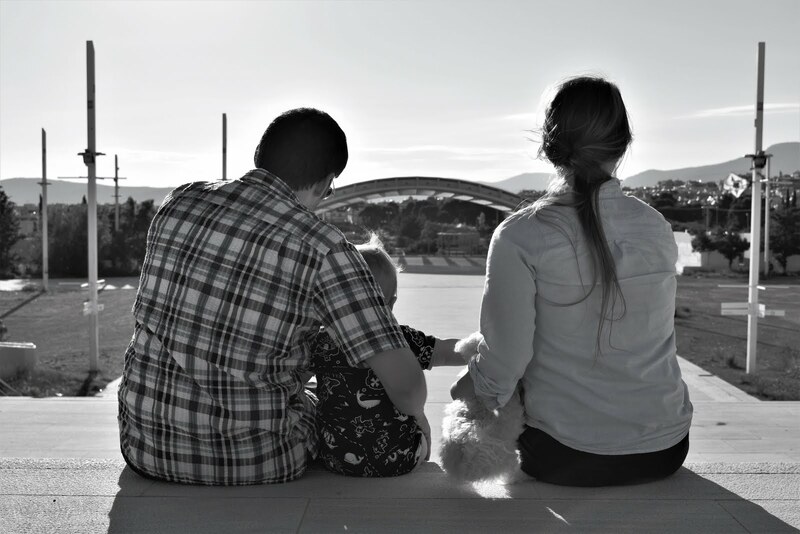 I maintain this blog primarily for our family and friends (Hi, everyone! ), but it's also listed as a resource for people who are looking into the foreign service lifestyle. Summertime is a big transition season for people in this line of work, and I want to share some of my experiences about pack out, traveling with a dog, how to navigate a new country, and other useful, related things for people who feel as naive as I did. My tentative plan is to include checklists, and crap like that. If you start seeing some of these only-useful-to-a-very-small-subset-of-the-population posts, take heart. This will just be a temporary deviation from my standard plant killer posts. I'm also planning to throw up an Athens guide Phil made for our friend. He listed our favorite sites and restaurants in the area. We won't charge you for it this time. Happy Sunday from your favorite, cursed, Athenian expats. Or expat Athenians. Whatever we are. Oh, p.s., Phil's been cursed on the street, too, though it was eleven years ago.